If blogging is part of your digital marketing strategy (and if it’s not, why not?) you’ll know how time consuming it can be. How can you know if the time you invest in sharing your knowledge and expertise via your blog is paying off? I’ve been blogging for 10 years and written over 1,000 blogs and won numerous awards, and it’s a vital part of my content marketing. 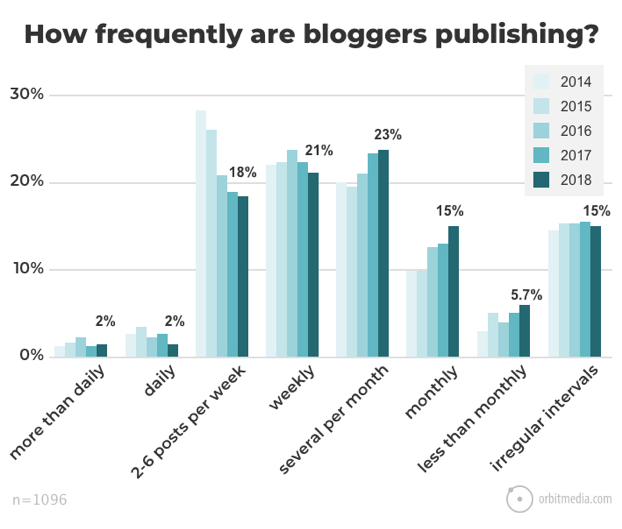 So I found this survey of bloggers and blogging by Orbit Media really illuminating, and picked out some of the highlights for you. 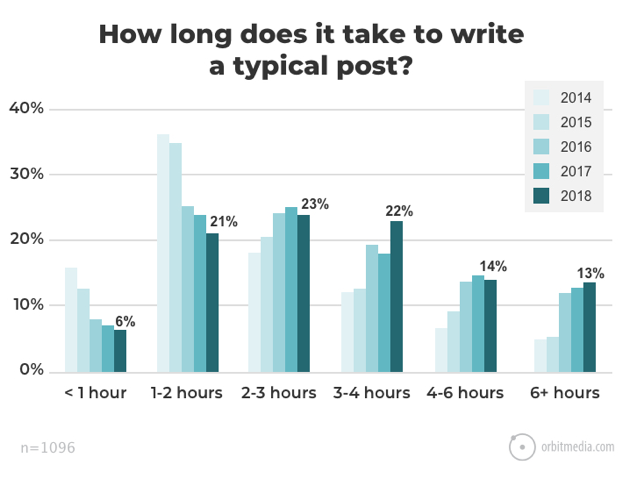 How long do business owners spend blogging? 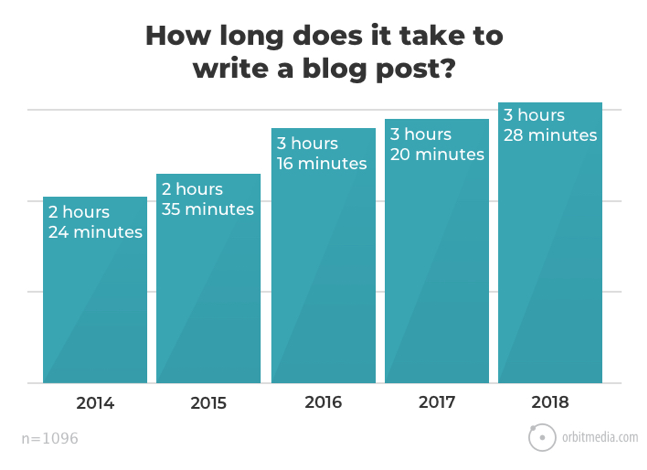 As you’d expect, in a world where more and more people are blogging, the average time spent on a blog has increased from 2.5 hours in 2014 to 3.5 hours. That’s a huge 44% increase! 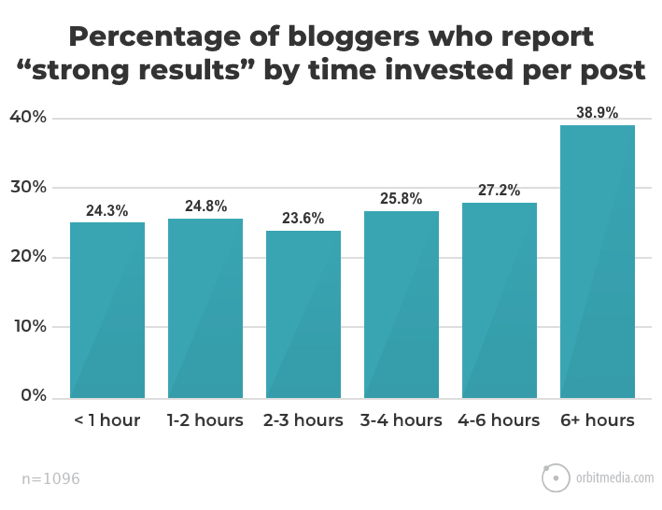 But as you’ll see below, some people spend a lot more, with some bloggers spending over 6 hours on a typical post. If you’re spending that amount of time per blog, you’ll definitely want to know that your efforts are paying off. And the good news is that, according to this survey, time spent and results do correlate. Again, this has changed, and if you’ve been keeping up to date with SEO developments you’ll know that Google rewards high quality content. See my blog about SEO trends in 2018 for more SEO thoughts. The average length of a blog has increased by 43% over the last five years – from 800 to 1151 words. Looking deeper into that though, 55% of bloggers keep their posts under 1000 words. 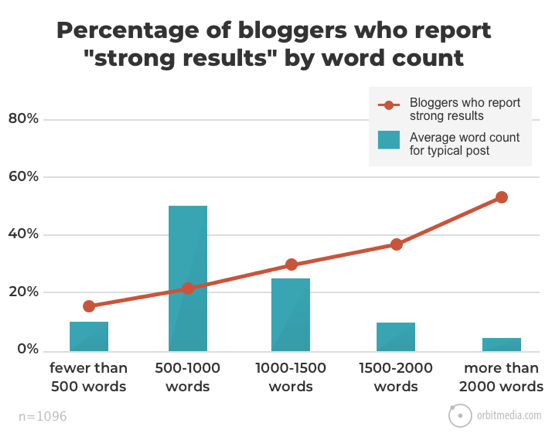 Over half of bloggers who write articles of 2000+ words report ‘strong results’. You’ll see below that over 1000 words, the longer the post, the more likely the blogger is to report strong results. Apparently, engagement is in the detail. 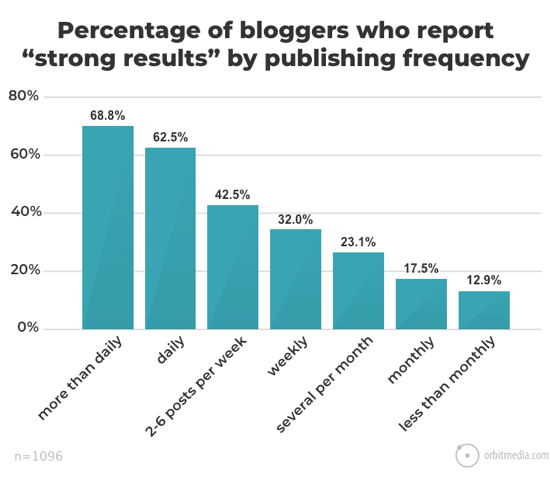 How often should I publish a blog post? The good news for your workload is that, whilst successful bloggers are publishing longer articles, they’re doing it less frequently. The largest percentage (23%), report publishing ‘several per month’. But don’t be fooled by this into thinking that you should scale back on your publishing frequency. 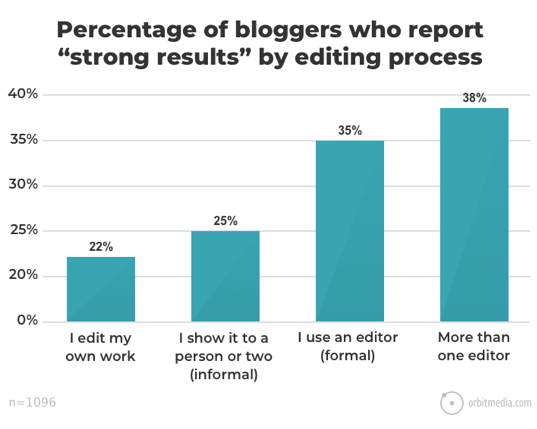 As this next chart shows, the percentage of bloggers reporting ‘strong results’ increases with frequency. For you, it’s a case of finding a balance between the length of your blogs, how much time you can devote to them, and how often. Should I get help with blogging? 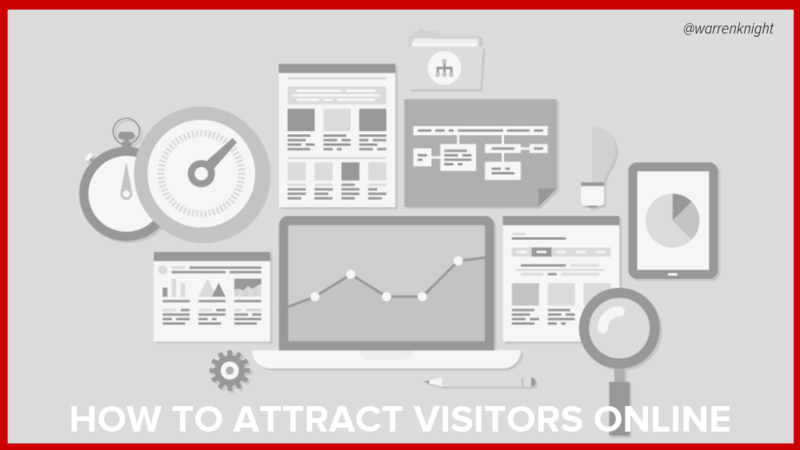 However frequently you are able to blog, there’s no doubt that quality content is vital. You may be happy writing and editing it yourself. But there are definitely advantages to using a professional editor, as this chart shows. Does checking my Analytics make a difference? The simple answer is ‘yes’. If you’re measuring your results regularly, you’re more likely to see ‘strong results’. Over 40% of bloggers who always monitor their analytics report ‘strong results’, compared with less than 15% of those who say they never (or rarely) monitor their analytics. Though how that latter group knows is a bit of a mystery! What should I be including in my blogs? It shouldn’t surprise you to know that bloggers are including a range of media in their posts. Use of multiple images, lists, video and audio are all on the rise. Using engaging media (video and audio) is also more likely to deliver strong results. As you can see above, audio is less used, but a massive 45% of bloggers who use audio report ‘strong results’. 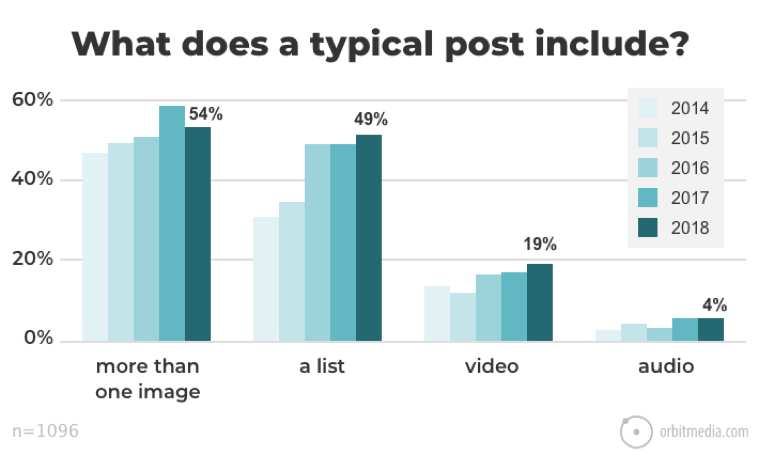 That figure drops to 37% for video, and 31% for multiple images and lists. These are some of the highlights, and you can read the full survey results here.